Approximately 14.8 million adults in the U.S. have been diagnosed with chronic obstructive pulmonary disease (COPD), with an estimated 12 million people likely to have the condition, but not yet diagnosed.1 Many of these cases could be linked to occupational exposure from dangerous airborne dusts, fumes, and other substances. Implementing workplace monitoring solutions could be the key to reducing these statistics. The process provides real-time data about dust levels, enabling employers to identify general areas and specific activities that increase exposure, implementing processes to mitigate risks. Highlighting the importance of maintaining healthy PELs, OSHA enforced a new regulation on September 23, 2017 that reduces workers’ exposure to crystalline silica. The regulation stipulates that personal exposure should be limited to 50 micrograms of respirable crystalline silica per cubic meter of air (µg/cu m), over an eight-hour period. This places more stringent requirements on employers to implement better methods to reduce exposure. These methods include monitoring programs and maintaining records of exposure, as well as offering medical examinations and training individuals about silica-related hazards and how to limit exposure. OSHA estimates this new rule could save up to 700 lives per year. If initial results indicate exposures are below the action level (25 µg/cu m), no additional monitoring is necessary. If the monitoring results indicate exposures are above the action level, but below the PEL, additional monitoring would be required within six months. If the monitoring indicates exposures above the PEL, additional monitoring must be repeated within three months. If subsequent monitoring (not the initial monitoring) indicates exposures are below the action level, the employer must repeat the monitoring until two consecutive measurements (taken seven or more days apart) are below the action level. At that point, the employer can discontinue monitoring. Monitoring solutions are effective in measuring exposure limits, ensuring appropriate action is taken if levels are exceeded. Who is exposed and to what? How long are they exposed for? How much are they exposed to? Monitoring must be done in a way that it does not impact the comfort or productivity of a worker. Real-time dust monitoring solutions generally can be used for general spot checks, walk-through surveys, and individual monitoring, as well as detecting the total level of dust in the air. These instruments highlight exactly when and where excessive dust levels are occurring to support real-time rapid decision-making. Monitoring is a procedure that instantly yields results, equipping employers and employees alike with greater knowledge, which leads to positive workplace health programs. For crystalline silica, personal monitoring is essential, and employers must rely on personal dust sampling pumps. Integrating monitoring pumps should become an established part of the health and safety process for companies. As a result, companies save valuable time while protecting employees which enhances business efficiency. The number of American’s suffering from respiratory conditions as the result of workplace exposure is a serious issue. To ensure such cases are reduced, monitoring is crucial. Tim Turney is technical product manager, Casella. 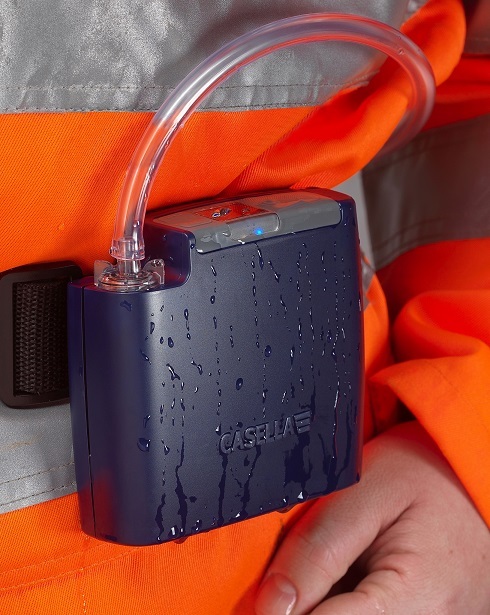 Casella is dedicated to reducing occupational health and environmental risks through a core competence in dust, noise and vibration monitoring. For more information visit, www.casellasolutions.com.